If you've got a thing for floral dorm room decorations, this Passion Flower - Window Peel N Stick will make a wonderful addition to your college dorm room decorating ideas. The Passion Flower - Window Peel N Stick is a gentle dorm window accent that makes your dorm room look like an enchanted garden. 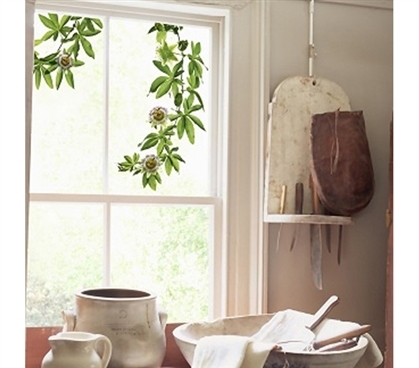 With the Passion Flower - Window Peel N Stick, your dorm room will always look like a fresh spring day. The Passion Flower - Window Peel N Stick is a cheap, cool, and dorm room safe decoration that you'll appreciate for its simplicity. With the Passion Flower - Window Peel N Stick, you'll never have sticky window residue. Peel N' Stick peels off invisibly. Use the Passion Flower - Window Peel N Stick to add a sweet and serene look to your dorm room. You can stick on as many Peel N' Sticks as you want since there is no threat of surface damage.